Thank you again Miss Athena! I placed my order for several items already- The honey pots and a jinx killer 13 day bath. I think only got enough for one day, so I will def. Need to order some more. I am also looking forward to my copy of Deliverance. Looking forward to clearing any work that hasn't been working for me. Or work that I may have done to get back an ex that isn't meant to be belong to me (old, old). I think that may be part of the reason why I haven't seen any progress in that area. I was looking over the forum and I didn't see an answer to your question. I have both lived with a parent who was a clutter-bug and also was one myself when dealing with depression. I can offer you this: my own lesson- Start small and stay consistent. The first things I started to do was remove duplicates, obvious trash, and things she hadn't touched in years, that she wouldn't even miss. If it was broken and could no longer serve it's purpose, it went. I spent a lot of time showing her the alternative. Like clearing an area and putting some nice flowers there so she could see what was possible. Think small improvements for the good. Also think about the projects that they want to accomplish. Can't bake if all baking ingredient are disorganized right? Before long she was asking me for help to go thru her stuff. I would also burn incense or things that smell good and fresh. It's not easy, but it can be done, if you do it gradually. Lastly, if any of the items are usable- why not list them on let go or have a huge yard sale- the goal to make money for some of the repairs... Try to show them how it can benefit them. And maybe a honey jar or two, to have them sweeten to your way of thinking... I am going to be creating these for the first time, for myself in a couple of weeks, but I see people recommend them a lot here. I am pulling myself out of my depressed/crossed state myself and and every time I clear a corner or purge something else, I feel better. What I believe miss Cat was saying is put two candles on the corners/edge of the bath that you enter and exit from, or on the floor on the same side. So that when you enter you are walking between the candles, and going between them when you exit. Not only are the candles used as candle spells, but they also represent a doorway. I don't know that this is the appropriate forum for this discussion and in fact I don't know that there is one. I will try to answer your question however and you can see for yourself why I would not be appropriate here, or so I believe. So, this is a hard question to answer given that the practice of hoodoo is such a multi-faceted one stemming from European, Jewish, African, Protestant Christian beliefs, and to a lesser degree, Catholic beliefs, the two latter being the traditions of which I am most familiar. This may be a question for our Resident expert, Ms. Cat but I'll try given my knowledge as a practicing Protestant Christian and Folk Catholic. In most protestant Christian denomination such as the Baptist religion which is where you'll find most of your hoodoo practitioners, salvation is found and granted while here on earth by accepting Jesus Christ as your lord and savior. This is done by giving a verbal confession and believing in your heart that God raised His son Jesus Christ from the grave. In most protestant denominations, in order to receive salvation or "peace" on the other side this would have had to be done while the person was living. Once their salvation had been secured it could not be taken away from them but if they did not confess their sins and accept Jesus as our lord then their soul, according to Christian doctrine, would be condemned to the lake of fire. It becomes different because there are different schools of thought on this. Some hoodoo practitioners adopt West African religious beliefs like that of ancestor worship; the honoring of those who have come before us. I honestly don't know in African religions or even Native ones that there is a concept of afterlife that can be gauged according to earthly deeds or lifestyle so I can't really be of help there. Catholicism however subscribes to to the idea that, more or less, you pray for a persons stay in in purgatory to be as brief as possible as they wait for their entrance into heaven, assuming they are granted entrance in the first place. Furthermore, this topic in and of itself is specifically regarding the cleaning of a home or actual person who may be afflicted a spiritual condition such as jinxing or crossing. I only addressed it here because I'm not sure that we have a forum on this discussion. Feel free to look around however. You might find exactly what you're looking for. My deepest sympathy to you and yours for the lost of your loved one. I am very sorry for your loss. Dr Darensbourg gave great advise and understanding from multiple religious stands. As a Christian who is Baptist I believe you are saved by Grace and purchased once one accepts Jesus. To pray for the dead is something you see in hoodoo, and working with ancestors is essential for the work. Creating a nice alter in your work area, offering flowers, water, items they liked, items they owned to commune with them will bring them into your life in the spiritual level. To help those in the family I use blessing and healing oil mixed together on white candles to pray over. Jesus makes specific promises for us about those who die in Christ one is we will meet again, other is blessed of those who mourn for they shall be comforted ( by God). That was wonderful advice Jaydee, Thanks for helping chime in on that one. It's always hard when we lose loved ones. The idea of working for yourself and your family when this happens alone is invaluable and very much encouraged. I did some justified crossing on someone’s finances after they ruthlessly crossed me. However they have finally righted the wrong - well enough of it for me to let them be. How can I cleanse this person while being ABSOLUTELY certain that nooooo negativity will come back to me as it lifts off of them. I do not have physical contact. It would have to be by a doll or using a candle. Would uncrossing oil on a candle be able to simply remove the negativity without reversing any of the energy onto me? Karma is not part of hoodoo, there is no rule of 3. Cleansing someone does not send it back, unless of course you ask it to. There is no absolutely no chance of anything in life unfortunately. You would destroy the item used to put the curse on them, you would ask God to end the curse in their life. You can cleanse them with a spiritual bath with a doll or candle to remove it. Then you will bath yourself in hyssop praying psalms 51 to remove sin, dress your body with protection oil and cleanse your house. Uncrossing is a great product to use, again your petition matters, to end the curse and remove it is fine. I have been reading a few threads and had an idea about mixing blessing oil with adam and eve oil and then using a pink candle to bring in a new unknown love partner. I may add some heating herbs to give it a little bit of spice. The petition is; [name] is blessed by Yahweh with a happy, healthy, stable, passionate and romantic relationship that fulfills [name] physically, emotionally and sexually. I had a look at the general petition on the LM website and felt it was too general covering many areas of life so decided to narrow it down towards a specific blessing. Do you think it is a good idea to mix other oils tailored towards a specific goal such as wealth, love, job with the blessing oil like described above with a petition? Or should the blessing oil be used by itself only with the petition? It's worth a try, as a wonderfully fulfilling romance is a blessing in life. I would leave out the Healing, as you'd be over-complicating matters. It's best to stay as focused as you can in one spell. Hello I do know if you have already d this question but when cleansing a home do you cleanse event room? Can you carry negative energy from a childhood trauma? And I was going to make a wash to clean my floors and wall with baking soda, white vinegar, sea salt, lemon juice and John the conqueror root is that too much? Floor washes are used to clear out negativity and then you replace it with the energy you want. I like pine scented cleaners or verbena, hence I love Lucky Mojo Chinese floor wash. Wash top to bottom back to front. Watch what you wash with and make sure it will not ruin paint or hard surfaces. Then light a white candle in each room after its done and dress it with an oil such as special oil number 20, peaceful home, fiery wall of protection, protection, van van. Pray and recite psalms as you do this. A spiritual bath is normally taken before you cleanse the house then the cleaning of the home. Last edited by Miss Athena on Mon Jan 14, 2019 4:14 pm, edited 1 time in total. For work as significant as spiritually cleansing your home, you would want to make sure you are using the correct formula. Chinese Wash is the traditional products for this kind of cleansing, and it contains all of the essential ingredients for a thorough house cleaning. You can order it right here from the forum by clicking on the blue button. How does one cleanse the home when there is a lot of clutter from family members, and you don't feel right to throw it all out or even organize it? I wouldn't feel right about it because it's my parents' clutter, and so it's a very different dynamic than, say, if I had children, and I cleaned up their clutter. I can offer to organize the clutter, but my parents always say "Later, because I want to go through it first." And then it never comes. There's a lot of dingy miasma in the house because of clutter and because of how nearly everything in the house needs to be repaired or replaced and we just haven't been able to afford it for years. I've cleansed the house with lots of purifying herbs, van van oil, have burned purifying herbs and resins, and I physically clean the house all the time. But, there's still heaviness from the excess stuff and mess around, and it's so much work to clean the clutter and under it. I'm the only one in the house who cleans a lot, and I feel like I'm fighting a losing battle because I can never get to everywhere without fighting the space and exhausting myself. What can I do in this scenario? What you've described is creating a carpet freshener, it is not a traditional hoodoo method for spiritually cleansing a home (which was your original question). For carpeting, you can lightly wet a broom's bristles in the diluted Chinese Wash and sweep it over your carpet. 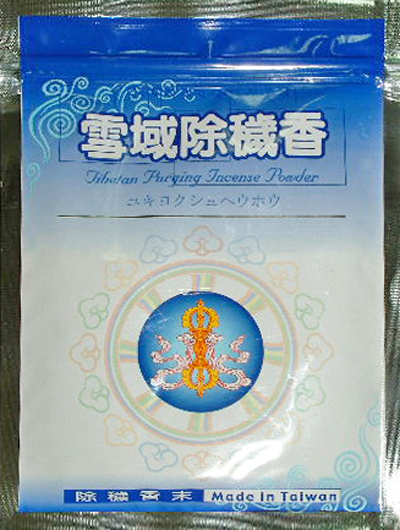 If you feel the space has a particularly heavy energy to it and you cannot do a thorough purge of clutter, then consider smoking the place with Tibetan Ghost Purging incense. This is a wonderful, and powerful, incense for clearing out negativity. Try it. Ooooh, that looks wonderful! I'll have to evaluate my budget and see if I can get this soon! It really is wonderful. Highly recommended. I must stock up myself as well. It’s been a while since I’ve posted mainly because I just haven’t felt up to it unfortunately. I think I really need to do some cleaning work for me and my household. However I have a few questions, I have a reading set up for 3 weeks from now but I need a little (lot) of help now. The energy in my house feels so off that whenever I try to straighten up to do my spiritual cleansing I get sick. I have four freezer jars in my freezer for two ex’s (that I just never thrown away) mainly because they are just generally freezer jar for dating but I had a target in mind that I wanted other women to stay away from but of course I didn’t add his name and one for in general women trying to date men who are dating me (I’m not dating anyone at the moment because one no one shows interest for longer then getting my phone number and I promise I’m not joking but I’ve been told I look like ariana grande (only my hair is tightly curled and I’m athleticly build not as skinny ) so I have no clue on why no one is interested, except my energy is off. And the last freezer jar is filled with 3 people by name because they kept trying to set me and I wanted to keep there actions on ice. I put some peppers in the jar to confuse them and keep me safe and a lemon and like two other things my former root worker told me to add. My questions are, is a freezer jar a curse? Because I didn’t want to curse anyone I just didn’t want my boyfriend (s) dating other women and I wanted those fake people around to stop trying to hurt me. My second question is one of my ex’s and I have been hangout lately (not the one that hit btw) and he told me that’s he’s been dating a few different women but he’s not serious about anyone because he’s never moved on from us. The question is should I do another freezer jar to add the the the freezer ones I have? Or are the ones I have fine because I made one when he and I were together and it’s the long one that Miss Cat had listed on the form a few years back but I did add some names of women I knew he liked or liked him or they were just to friendly to each other. The reason I ask about another one is because I have a picture of two potential new women but I don’t know who the other women are. My third question is because like I’ve mentioned before I get sick when cleaning the house and my house is too big for me to clean alone anyway. Can I spike my cleaning products for cleansing the house and pray over them and then hire a cleaning company to clean it? Because I’m really overwhelmed with the process of cleaning a four floor house alone. Sorry for the book but I’d like to get started before my reading so there’s no blocks of seeing my future during my reading due to my own blockage in home and on self. No, a freezer spell is not a curse and it won't harm anyone. It merely puts them "on ice" as in freezing their progress or movement. In your case, freezing out love rivals will stop them from gaining any kind of ground in a relationship with your target. Nobody gets hurt, they just don't get ahead. Yes, you could trick your cleaning supplies and have a company clean your home. However, I personally find a lot of fulfillment in doing at least part of the work myself, as I approach cleaning as a ritual. Then again, I don't have a four-story house to contend with! 1. I live in a two story house with a finished basement. Everything I have read says to go top to bottom, finishing out the front door. But, my front door is on the main level (so, there is a main level, an upstairs, and then a basement below the main level). The basement does have a door, but we rarely use it. should I start on the top floor, go down to the main level and then go down to the basement, but then come back up and wash out the entryway out the front door? 2. For the incense-burning after the house cleansing, do I leave the incense to burn in each room or can I walk through the house reciting a prayer? The latter would be more cost effective for me as my house has a lot of rooms. 3. Do I recite the 23rd Psalm throughout each step: after I've washed the walls and floors, before I light the candle, after I light the candle, as I am incensing? 4. I have read many posts saying to anoint the doors with an oil after you have cleansed the room, but i'm not sure exactly how to do this and which oil to use? Would peaceful home be appropriate for my intention--to clear out the space of negativity after a break-up? I was planning on using Peaceful Home oil on the white candles too. 1. Top of the house to the bottom, top floor ceiling to floor, basement ceiling to floor then main floor ceiling to floor, out the front door. 2. Yes you can walk and pray as you carry incense. 3. It is common to recite Psalms, parts of the Bible, and pray as you clean the home. 4. Yes you can dress the door with peaceful home oil, you can burn a white candle in each room dressed with the oil, you can put protection oil on the doors and windows, I normally would make a cross with the oil. Thanks JayDee! Where would I make the cross? Can be made on the sill of the window, the wood base, even the glass ( assuming you dont want an oil streak so less likely). Door you would do the same thing.